The ASA currently publishes 10 academic journals as well a four section journals. 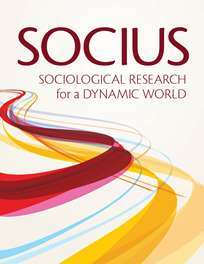 Of those journals, Socius is an online-only gold open access journal and Contexts is published in a magazine format. For a full history of the ASA and its journals, read the ASA story. American Sociological Review: Prior to 1936, the official journal of the American Sociological Society was the American Journal of Sociology, through an arrangement with the University of Chicago Press. In 1934, the Society decided to establish its own journal, the American Sociological Review, which was first published in February 1936. The inaugural editor was Frank H. Hankin. (See 1981 Rhoades History; chapter 5, pages 31-32). Contemporary Sociology: Prior to 1972, book reviews were published in the American Sociological Review. ASA Council voted to create a separate journal for reviews (and to limit ASR to articles). 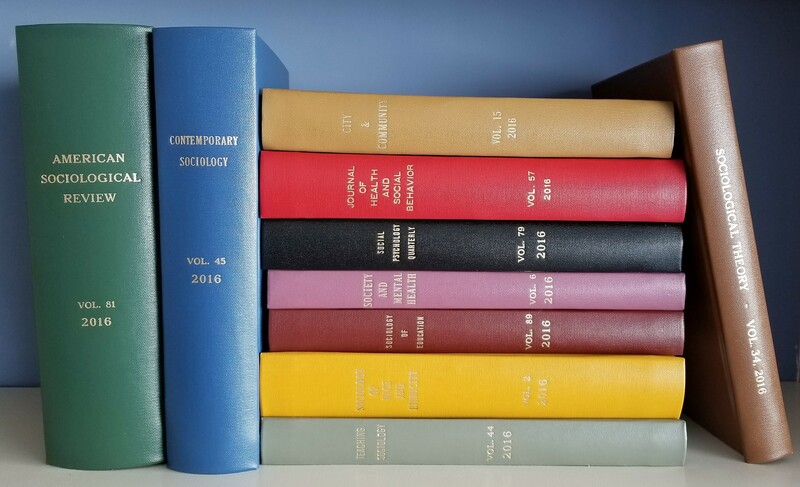 Contemporary Sociology was first published in January 1972 as a new ASA journal. The inaugural editor was Dennis Wrong. See 1981 Rhoades History (chapter 9, page 68). City & Community. In 1999, Council approved the Guidelines for the ASA Publications Portfolio, allowing for section-sponsored journals. City & Community, sponsored by the ASA Section on Community and Urban Sociology, was approved by ASA Council and published its first issue, edited by Anthony Orum, through a partnership between ASA and Blackwell Publishing in March 2002. See A History of the American Sociological Association, 1981-2004 (chapter 2, page 61). Contexts. In 1998, ASA Council approved launching a new journal to be published in magazine format, aimed at sharing sociological research with a wide audience. Claude Fischer was appointed Contexts’ inaugural editor in 1999. The first issue was published in Winter 2002 through a partnership with the University of California Press. See A History of the American Sociological Association, 1981-2004 (chapter 2, page 61) Footnotes 2002 (page 1). Journal of Health and Social Behavior. In 1966, the ASA acquired the Journal of Health and Human Behavior. Originally founded in 1960 and published by the Leo Potishman Foundation at Texas Christian University, it became an official ASA journal in 1967, retitled the Journal of Health and Social Behavior. The first ASA issue was published in March 1967 under the editorship of Elliot Friedson. See 1981 Rhoades History (chapter 7, page 53). Journal of World-Systems Research. A biannual, open-access peer-reviewed journal established in 1995 by founding editor Christopher Chase-Dunn at the University of California-Riverside, in 2008 Council approved a recommendation for formal sponsorship by the ASA Section on Political Economy of the World-System. The first ASA copyrighted issue appeared online in 2009, edited by Andrew Jorgenson and Edward Kick. See Footnotes 2008 (page 8). Rose Series in Sociology. The series is supported by the ASA Rose Fund, established in 1967 through a bequest to the ASA from Arnold and Caroline Rose. At the time named the Rose Monograph Series, it published its first volume in 1971 (Deviance, Selves, and Others, by Michael Schwartz and Sheldon Stryker). Thirteen volumes were self-published by ASA from 1971 to 1975. From 1976 to 1992, volumes were published for the ASA by the Cambridge University Press. From 1993 to 1995, volumes were published for the ASA by the Rutgers University Press. In 1994, Council decided to change the scope and definition of the series to publish works that integrate areas and raise controversies across the broad sociological audience. 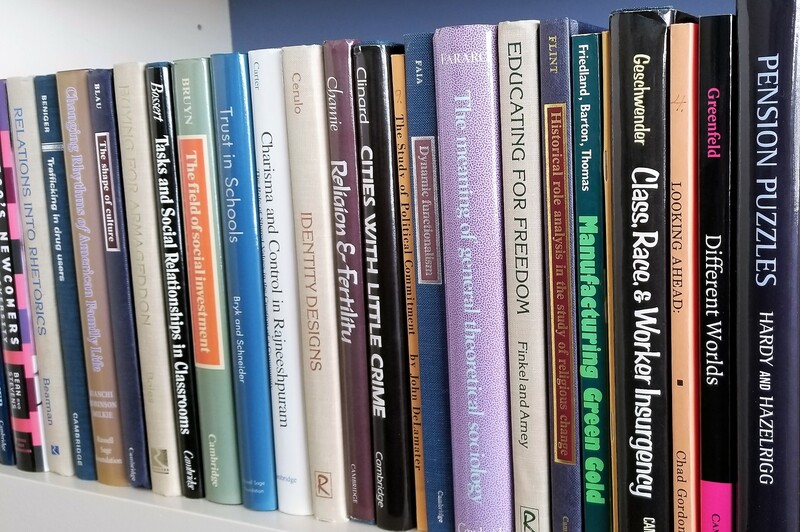 Renamed the Rose Series in Sociology, after a brief hiatus the ASA partnered with the Russell Sage Foundation for future books in the series, the first of which appeared in 2001. See A History of the American Sociological Association, 1981-2004 (chapter 2, page 61). Social Psychology Quarterly. In December 1954, J.L. Moreno offered Sociometry (founded by Moreno in 1937) as a gift to the American Sociological Society. The society began publishing it in 1956 as its second official journal with Leonard S. Cottrell, Jr., as editor. The name was changed to Social Psychology in 1978, and to Social Psychology Quarterly in 1979. See 1981 Rhoades History (chapter 7, page 43). Society and Mental Health. In 2008, ASA Council approved a proposal to launch a new section journal from the ASA Mental Health Section. The triannual journal published its inaugural issue in March 2011 through a partnership with SAGE under the editorship of William Avison. See Footnotes 2010 (page 6). Sociological Practice Review. In early 1987, ASA Council voted to launch a new ASA-wide journal on sociological practice. Sociological Practice Review (SPR) was approved for a three-year trial period, during which any losses would be underwritten by the ASA Rose Fund. The first issue was published in June 1990 under the editorship of Robert Dentler. Two issues were published in 1990, and four each in 1991 and 1992. In August 1992, ASA Council voted to cease publication of SPR as the journal had not attracted the subscriptions or submissions necessary to become financially and intellectually viable. While efforts were made to encourage another publisher to take over publication of the journal, those efforts were not successful and the last issue was published in October 1992. See Footnotes 1987 (page 1) and Footnotes 1992 (page 1). Sociological Methodology. Previously published by Jossey-Bass as an ASA sponsored annual volume in 1969-1985, Sociological Methodology became an official ASA journal, retaining its book format and edited by Nancy Brandon Tuma, in 1986. See A History of the American Sociological Association, 1981-2004 (chapter 1, page 20). Sociological Theory. Previously published by Jossey-Bass as an annual volume in 1983 and 1984, Sociological Theory became an official ASA journal, published semi-annually and edited by Randall Collins, in 1985. See A History of the American Sociological Association, 1981-2004 (chapter 1, page 20). Sociology of Education. In 1958, the ASA Liaison Committee for Sociology and Education encouraged the American Sociological Society to negotiate for the Journal of Educational Sociology. In 1963, the Society (by then renamed the American Sociological Association) acquired the journal from the Payne Educational Sociology Foundation. Renamed Sociology of Education, the first ASA issue appeared in Autumn 1963, edited by Leila Sussman. See 1981 Rhoades History (chapter 7, pages 43-44, and chapter 8, pages 52-53). Sociology of Race and Ethnicity. In 2013, ASA Council approved a proposal to launch a new section journal from the ASA Racial and Ethnic Minorities Section. The quarterly journal published its inaugural issue in January 2015 through a partnership with SAGE under the editorship of David Brunsma and David Embrick. Footnotes 2015 (page 6). Socius. Launched in 2016 as the ASA’s first open-access journal open to all areas within the discipline. Socius aims to make new research quickly available by providing an online forum for the rapid dissemination of high-quality, peer-reviewed research, produced in time to be relevant to ongoing research and policy debates. Inaugural editors Lisa Keister and James Moody began accepting submissions in August 2015 with the first articles published in an online-only, open-access format in January 2016. Unlike ASA’s “traditional” journals, articles are published under a Creative Commons licensing agreement, with authors retaining copyright. See Footnotes 2014 (page 11) and SRE Press Release. The American Sociologist. Launched as an ASA journal in November 1965, The American Sociologist (TAS) was published as a tabloid newsletter in 1972 as a one-year experiment, and returned to quarterly journal format in 1973. (Footnotes was founded as the format ASA newsletter when TAS returned to journal format.) In January 1982, ASA Council voted to cease publication of the journal, which published its last ASA issue in November 1982. Several years later, ASA transferred the rights to the name The American Sociologist to Transaction Periodicals, who began publishing a journal by that name in 1987. ASA retained the rights to issues published from 1965 to 1982. See Footnotes 1982 (page 1) and Footnotes 1986 (page 11). Teaching Sociology. After two years of negotiations, ASA purchased Teaching Sociology from SAGE, which had founded the journal in 1973. The ASA Teaching Newsletter was incorporated into the journal and ceased publication. The first ASA issue appeared in January 1986, guest edited by Michael Bassis and Hans O. Mauksch. Theodore Wagenaar was the first appointed ASA editor of the journal. See (A History of the American Sociological Association, 1981-2004; chapter 1, page 20).